Tired of Gelman? Study for finals in the Library of Congress instead. It’s a little bit of hike to the Capitol, but the Library of Congress is perfect in every other way. 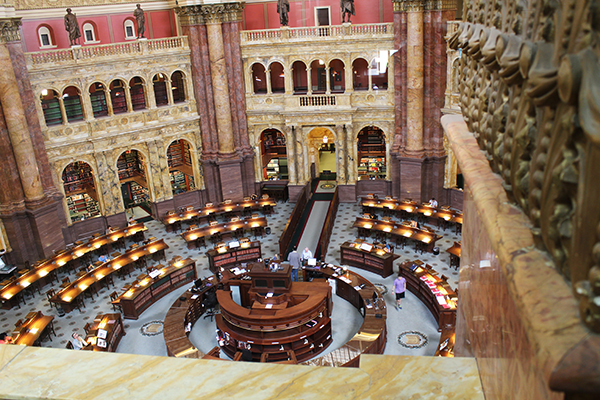 Spend time in the Jefferson Building’s Main Reading Room (101 Independence Ave. SE) and study under the watchful eye of literary greats like Shakespeare and Socrates – or at least their statues. The library also hosts events and features inspiring galleries to help you get through that history paper or English final. You actually can find green space on campus. Grab your books, use the free towel you’ll receive at the end of Colonial Inauguration and spend some time on the University Yard lawn. It’s much closer and less touristy than the National Mall. Don’t overlook Duquès when scoping out a study spot. There are plenty of couches and tables, giving you a less-crowded alternative to Gelman Library, though that could change during finals week. Find a room with windows facing 22nd Street for a skyline view of campus. Plus, the building is open until 2 a.m. The Mount Vernon Campus offers more than a dreaded commute to your University Writing class. Ames is one of the most under-utilized spots for cramming or writing papers. With coffee, sandwiches and snacks at Zebi and study rooms with large windows and ample table space, you’ll appreciate Ames when midterms come. This patio offers an escape from noisy roommates and dark Gelman cubicles. You’ll find outlets for charging your laptop or phone under the concrete ledge that wraps around the terrace. Scoot a table close if your power runs low. The terrace closes at midnight, so don’t plan for an all-nighter beneath the stars. Ditch Starbucks and Dunkin’ Donuts and walk over to Peet’s Coffee & Tea right by the White House. The atmosphere is fun, the drinks are delicious and the shop has free Wi-Fi. West Coasters, head there for reminders of home. Need to finish some reading? Walk down to the National Mall, highlighter in hand, and dive into your textbook at the Lincoln Memorial. Avoid the steps, which will always be swarming with tourists, and instead find a shady spot for scenic studying.